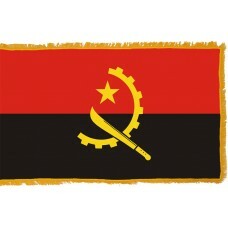 The Angolan flag consists of an upper and lower rectangle of equal size. The upper section is red in color and the lower is black. A little over center is a display in yellow that features half of a gear with a machete resting on it about 2 thirds down the cog. A 5 pointed star sits on the upper inside edge of the gear. The symbols on the flag are reputed to have been inspired by the long-standing hammer and sickle design born by some other country’s flags. In this case, the machete represents the country’s agriculture while the half gear, or cog alludes to the importance of the country's industrial endeavors. The use of yellow is said to be symbolic of the mineral wealth that the region enjoys while the black and red rectangles represent a "freedom or death" ideology. The earliest history of Angola dates back to the Middle Ages when the country consisted of several kingdoms. At that time life was agriculturally based and the inhabitants were advanced enough to be able to create and work metal and make pottery. As far as European influences are concerned, the first visitors were the Portuguese who arrived there in 1483 but didn't create a settlement until 92 years later in 1575. As with many other African countries at the time, Angola supplied a ready-made population of slaves for Portugal who transported them to many other places including Brazil. In 1885 when Africa was divided up among the European nations that had formed settlements there, Angola came under the full control of the Portuguese. It wasn't until the 1920s, however, that they actually gained total control of the country. The country became independent in 1975 and immediately fell into an atrocious civil war that continued until a ceasefire was declared in 1991. It didn't end there however and despite two subsequent ceasefires in 1992 and 1998 fighting that went on until 2002 and left the country in ruins. Oil has been one of the country's leading sources of export and it is the money generated from this commodity that has funded the steady rebuilding of its infrastructure. In 2010, the new constitution came in to force and the stability of the country continues today. 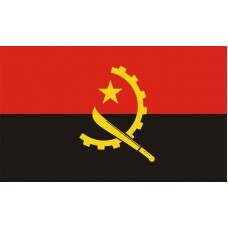 Changes were proposed to the design of the Angola flag but never carried out and it remains the same to this day. The country is a member of OPEC and the United Nations along with a place in the African Union. Despite having a population that is made up of many diverse ethnic groups, Portuguese language, and the Roman Catholic religion still feature prominently. The country's economy is set to grow as it is the largest producer of Sahara African oil. Money gained through oil provision has recently been invested in mining the rich deposits of minerals including diamonds which were producing one billion dollars a year as far back as 2002. Despite this increase in the economy, somewhere in the region of 70% of those living under the Angola flag still exist on incomes that are well below the poverty line.